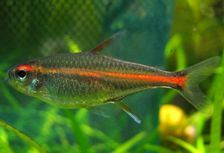 These Tetras originate from the Essequibo River in Guyana and are found in forested tributaries. This Tetra loves to swim across a long tank with plants along the sides and rear. You should keep the water current slow. They also like to have low light level or light that shines through floating plants. Glowlights are very peaceful, non-fin nipping, fish that can be kept with long finned fish. They are not recommended to be kept with any fish larger than a Blue Gourami though. Larger, aggressive fish will eat them as quick as they can catch them. These are wonderful community fish that should be kept with similar sized, non-aggressive fish. The females will be larger and fatter than the males. Males are more sleek in appearance. These little guys do best when schooling with a group of six or more. Less than that and they tend to be shy, hiding in plant cover. These Tetras are reasonably hard to breed. They need a heavily planted aquarium with low light. They also need soft, slightly acidic water at 82°F to initiate spawning. When spawning does happen, the female will scatter transparent eggs among the plants. Afterwards, remove the adults because they will eat all the eggs that they can find. The fry hatch in about 24 hours and swim four days later. Feed the fry baby brine shrimp and crushed flake food. It is important to keep excellent water quality for the fry to survive. You must do 25% water changes every few days until the fry are grown. For more information, go to Wikipedia's Glowlight Tetra page.